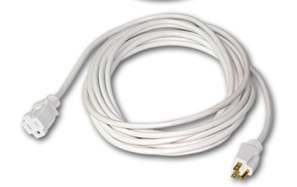 Our White 12 Gauge Extension Cord fits perfectly with your special event tent decor. Orange or black extension cords strung through a beautiful white tent are the fashion equivalent to wearing a print tie with a striped shirt. Stylish people simply don’t do it. Our white extension cords add the proper finishing touch to any tent decor that requires power. Tucked into the eves and secured by the straps that hold the tent to the frame, the cables all but disappear.